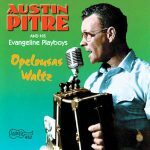 Although this collection of two-steps and waltzes was recorded LIVE in Austin Pitre’s garage and at a 1971 dance in Opelousas, Louisiana, the sound is immediate and vital. 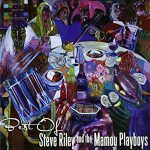 This CD provides some engaging examples of traditional Cajun music at its best. Austin’s voice has the nasal, gravely sound typical among Cajun singers. 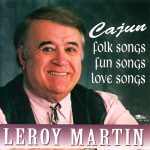 He and the tight-sounding band play a host of Cajun standards. The excellent liner notes by Ann Allen Savoy really give you the context for this music: hard, hard sharecropper work during the week with making music and dancing on the weekends. There are fascinating tidbits like how the famed “fais do do” — where mothers put their children to sleep in an adjacent room and then rejoined the dance — disappeared with a 1952 Louisiana state law barring children from anywhere alcohol was served and a few rare insights on the Cajun music scene from the woman’s side. 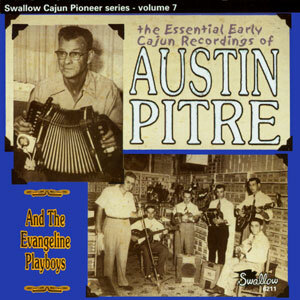 The music is classic Cajun with accordion, fiddle, guitar rhythm, and drums with the bass drum providing a foundation thump. Released in February 1997, 18 tracks.